my sister and her husband spent the past nine days with us which was sooooooo wonderful. we decided to put them in our master bedroom so they could sleep in a bit - when you are on your honeymoon, getting woken up at 6am by shrieking kids outside your room is so not cool. it was a great decision, too, as it forced me to clean and tidy the room we used as our lounge space for most of 2010 and was still super cluttered with crap. ta dah! i thought i'd better take photographic evidence as its not likely to stay this way for long... plus now i can finally show off the BEAUTIFUL king sized bed frame that my husband made us last year. he picked out some lovely pieces of blackbutt and stringy bark timber and, after a bit of sketching and working out dimensions, basically put it together in a day. handy, handy that husband of mine. he does good work. I love this room - very grown up and put together - not at all like you live in a house with small kids ;) I wish my bedroom was this tidy!! I love this room too and so get the need to document it before it becomes more "lived in". Blackbutt. I miss blackbutt. Though you'd think now that I live in the US I'd see plenty (haw haw). But yeah ... those Australian timbers. Your bed is beautiful! can i borrow your hubby? No? Oh go on! 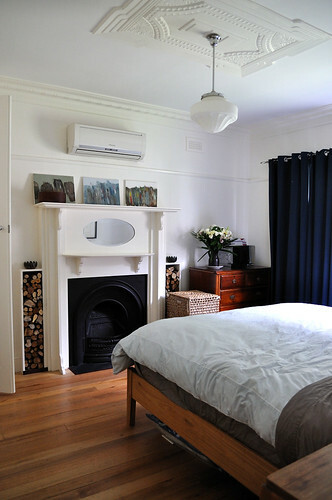 Lovely room and that bed is fabulous - you have inspired me to finally go and pick some gum leaves and bark and go dye! First, he made that bed. Wow, pretty amazing. I absolutely love the blue curtains in the white room and all the old details- the ceiling and fireplace. A lovely, relaxed and simple room - right up my alley. Very nice!! Love that high white ceiling too. This is a gorgeous room. 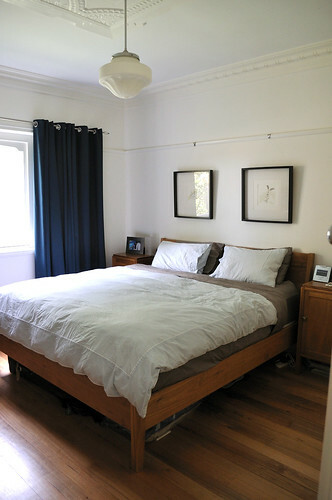 We too have a beautiful, big, wooden bed that I insist on making nice and neat so that when the rest of the house is in disarray, I can walk into our room and sigh with relief that there is some calm space in our lives. Not so easy to keep things tidy with two little ones, but so lovely when it happens. That all looks STUNNING!!! What a talented pair you are! (P.S. I showed old Tones the paintings on the mantel, and he beamed with happiness). ~your room looks lovely and peaceful,just the place to get some rest! I wish I had a handy Hubby! Your new bed is really lovely and your room looks fabulous. I love the timber stacked beside the fireplace.